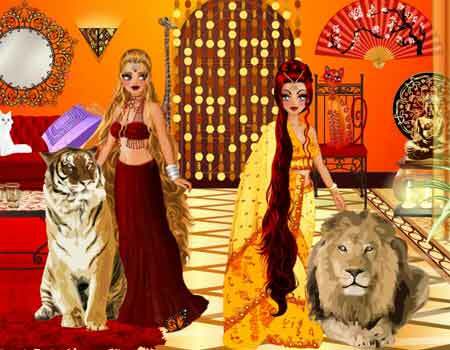 There are plenty of games like Stardoll out there that appeal to the fashionista in you. 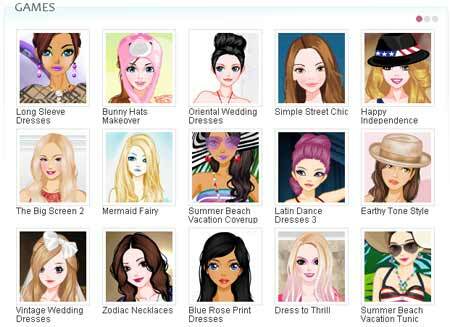 These interesting titles enable you to dress up dolls and virtual models with the latest threads. What’s more, they needn’t conform to any particular fashion rule that has been put forth by famous designers. You can set your own trends and adorn your model with funky clothes, chic accessories and even loud makeup, if you wish. We have jotted down 9 great options that enable you to do all that and a whole lot more. The social hangout called I-Dressup urges you to create, communicate and participate in a number of ways. You can unleash your stylish side by creating unique personal profiles across the website. Besides just hoarding flash dress up games, it also boasts of being an online community that allows members to tap into their innate chic characters. And you’ll be happy to know that the dress up games, decorating rooms, making your own iLook or iToon and saving dolls in albums are all free, so indulge away. Although there’s no real restriction as far as age is concerned, members under the age of 13 must seek parental consent before accessing a few iZone features. Passionate about fashion, friends and fun? Then Fashion Fantasy Game is the place to be. The online game and social network option crafted for young women allows you to create and sell virtual fashion designs across a competitive environment. It will also give you an opportunity to feel what it’s like to be an entrepreneur in the real world. Step into the shoes of a designer and store owner, and begin your online journey with a bank account that’s packed with the in-game currency, Fashion Buckz. There are even multiple challenges as well as weekly themed design competitions to dabble in here. 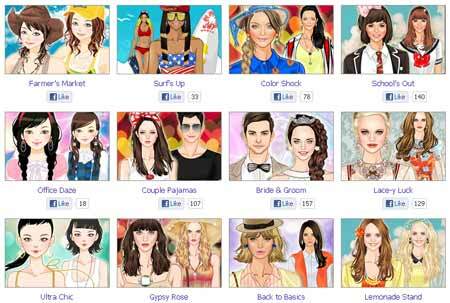 Looklet is a bit different from the other games similar to Stardoll. There are no competitions, no mini-games or any other such frills. All you get when you enter the site is a more than a 101 ways to dress up your model. This no-nonsense approach allows you to simply opt for your desired model, a snazzy backdrop to match and an apt effect for your finished product. And of course, there are loads of clothing options to take advantage of. From jewelry to dresses, you’ll be able to adorn your virtual model with the likes of Hugo Boss, D&G, Issey Miyake, Lipsy London, Mulberry, Zara, Karen Millen, Diane von Furstenb, Adidas and Acne, among others. Furthermore, if you fancy draping the slim siren with different types of clothing, you can choose from forms like knitted, suede, striped, checked, floral, feathers, plaited, transparent, lace, leather, plastic, fur and dotted. The developer of Maya’s Dress Up quips, ‘is fashion is your passion?’ Well, if your answer’s yes and you own an Apple iPhone or iPad then this particular application is just for you. Here you can easily create your very own styling combinations to match the occasions at hand. Whether you’re doll is off to soak up the sun at the beach or dressing for a dinner party, you’ll be able to drape her in the right garb. You can choose from cocktail dresses, ankle-high boots, mermaid skirts, long coats, bikinis, pareos and more, all via your trusty handset. Besides just clothing items, you can also try out various accessories like gloves, shoes, necklaces, earrings, belts, bags, swimwear, sunglasses and hairstyles. Do you have what it takes to go up against the pros? Well, the maker of Roiworld calls on all fashion enthusiasts to let their creativity unfurl across this style portal. They’ll be able to gain access to more than 65,000 clothing items that range from gowns to minis. Once they’ve created a whole slew of masterpieces, fashionistas can then share their creations with the whole world. Members can join in absolutely free of cost and create a unique avatar, enjoy interesting games, enter a fashion challenge, join boards and make new friends. And for all the hard work they put in, users will be able to earn special in-game points and gifts. 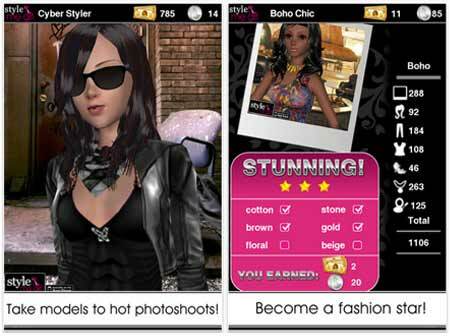 Looked upon as a strategy dress up game, Diva Chix offers much more than just competitions and dress up titles. This entrant in our Stardoll alternatives roster lets its members be creative and have fun as well as experience some valuable real life lessons such as managing finances, working as a team and succeeding in the fashion business. The aim here is to dress up your model with the best treads and pit it against other virtual dolls. You can create clothing items and open your very own shop to sell your ideas. They can then be exchanged for in-game currency. The fun doesn’t stop there. You can also form guilds which is a great way to meet fellow fashionistas and compete against other groups. What’s more, it offers free membership. Make way for the internet dress up game christened Doll & The City. Once you choose your model’s gender, you can give him or her a great hairdo, decide the makeup they should wear and even opt for fabulous outfits. Traverse into the city limits and visit stores like iDoll, Decorum, Black Cat, Lovelita, Fairy Tales, Aphrodite, Citystyle, Dollympia, Mc Doll, Lummart, AliBaBa, Fiesta, Cleopatra, Geekoplois and l’atelier. You can even take advantage of dress-up games that involve styling stars like Sandra Bullock, Julia Roberts, Adele, Nicole Kidman, Shania Twain and Shakira, among others. The 3D fashion game dubbed Style Me Girl lets your virtual models pose for photo shoots and walk the ramp, flaunting all your fabulous creations. From glamorous to gothic, you can use a wide range of apparels, accessories and clothes to obtain your desired style. You can further earn coins by playing the in-app style catch game. There are 30 different fashion genres to avail of here. And similar to Maya’s Dress Up, this inclusion in our games similar to Stardoll list can also be downloaded through portable handsets and tablets. In DressUp Challenge, you can ‘dream up that perfect look and make it a reality.’ And aiding you in this quest is the Makeover Creator that’s embedded within the website itself. With this tool by your side, you can easily fashion any type of ensemble for any event, season or party. Employ the use of various accessories, makeup and hairstyles to complement your overall look. So whether it’s a rock concert, luau party or candlelight dinner, you’ll be able to dress just right for the occasion. And as the name suggests, you can compete for the top spot and earn points and status on a weekly basis. The 9 games like Stardoll not only allow you to dress up virtual models but also dabble in some interesting online mini games and even share your creations with friends and family. These titles can be enjoyed either via the internet or through you handy mobile device. Whatever be the means, you can unleash your creativity and show your loved ones how passionate you are about style. The aforementioned games we’ve listed are great for budding fashion designers and youngsters who want to venture into the fashion industry. Do let us know which ones managed to tug at your heartstrings by leaving a comment or two in the box located below.